Anglophone Cameroon Literature is there to awaken us from our usual torpor. It testifies to the undiminished intellectual life of the homeland. Every homeland – as you’ll recall – always needs a voice in writing and print; and Anglophone literature, created, in the service of Humanity, shuns, the concerns of the fragmentary, neo-colonial elite and deals with the experiences of the marginalized in Cameroonian society ; workers, the urban and rural masses - Bate Besong. The author of ten plays and five collection of poems, Bate Besong is, without doubt, one of the most representative and regular writers of what might be referred to as the second generation of the emergent Cameroonian literature in English. 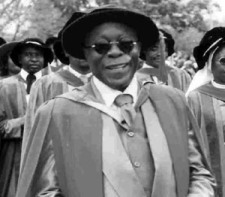 He was born in Nigeria of Cameroonian parents and did his Secondary and University education in Wole Soyinka’s country where several anthologies and literary works, as well as distinguished literary and academic bodies readily regard him as a Nigerian. He has been a Lecturer in the English Department of the University of Buea since the mid-nineties, and is well known for his uncompromising stance and incisive statements, which have earned him both friends and foes. Auteur d’une dizaine de pièces de théâtre et d’une demi-dizaine de recueils de poésies, Bate Besong est incontestablement l’une des plumes les plus constantes et les plus représentatives de ce qu’on pourrait appeler la deuxième génération de l’émergente littérature camerounaise d’expression anglaise. Né au Nigeria de parents camerounais, il fait ses études secondaires et supérieures au pays de Wole Soyinka dont nombre d’anthologies de littérature et d’instances de consécration n’hésitent pas à reconnaître comme l’un des leurs. Scattered Thoughts and Emotions is a collection of poems published and launched recently. Kuchah Henry Kuchah, the author of the work, sheds light on it and on other aspects of his writing, in this chat with Ndien Eric. Amongst other things, he says two Cameroonian writers who inspire him are Bole Butake and Bate Besong. Kuchah begins by presenting the book to the reader.